An Authentic Bend Experience Close to Downtown, Walk or Bike Everywhere! Experience Bend’s vibrant, local community with Bluebird Day Vacation! Lovingly restored and renovated, in a fantastic location. Chic and hip furnishings, modern updates, luxury bedding, and a fully equipped gourmet kitchen. Hop on a cruiser bike and explore Bend like a local! The Sparks Cottage is a quintessential mill cottage built during the time of Bend’s mill heyday, the Sparks Cottage has been fully restored and renovated with fabulous updates and all of the modern amenities you could ask for in your “home away from home”. 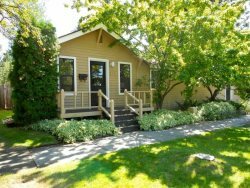 Tucked into a quaint and quiet neighborhood just around the corner from Chow restaurant (the local’s fave), Spork, sushi, organic grocery, bakeries, coffee… and all the fun shops on Newport Avenue, the Sparks Cottage is in the heart of all the best that Bend has to offer. You can literally WALK EVERYWHERE! Or hop on one of the 2 cruiser bikes provided and explore Bend like a local. So many delightful surprises await you in this wonderful cottage! The space is lovely and open with plenty of windows, gorgeous hardwood floors, chic modern furnishings and upscale decor. Cozy up by the fireplace and watch a movie from your own Netflix on the Smart TV, enjoy free high-speed internet, play games, or relax on the front porch and watch the day go by… Bend style! Prepare an unforgettable meal in the fully equipped gourmet kitchen newly updated with maple cabinetry, and gorgeous quartz countertops. Two sit-down dining spaces for 6 ensure many lasting memories to be made with families and good friends. The key to a fantastic vacation is a good night’s sleep! Enjoy gorgeous European style bedding with high thread count linens and down duvets. The master bedroom has a King sized bed, and there are two twins in the second bedroom which can be pushed together to form an additional King. There is a high quality Queen sized sleeper sofa with linens provided for your extra guests. There is a private patio with strawberry gardens and sit down dining for 4. Store your extra gear in the large garage. If you prefer to get out of town and into nature, there are endless hiking and mountain bike trails just minutes from town. The spectacular Cascade mountains and many lakes are and easy 20 minute drive providing endless opportunities for outdoor adventures. Phil’s mountain bike trails are an easy 3 miles to the west, as well as many walking and hiking trails along the Deschutes River right out your front door! Mount Bachelor Ski Resort is an easy 25 minute drive from Bend. This mountain is a blast, with a wide variety of terrain and trails that will keep you blissfully enthralled. There is a Mount Bachelor shuttle blocks away that will take you to and from the mountain. • Smart HDTV and cable. Watch your own Netflix! Great location in walking distance to coffee, restaurants, and a grocery stores, but still a quiet neighborhood. The home was furnished in a modern and stylish but comfortable manner. Perfect set up for our family of two adults and two kids. When an issue came up with needing light bulbs, the management was very timely and pleasant in their response. My family loved this cottage! Very clean, spacious, nicely equipped kitchen, great location, staff very easy to work with. I highly recommend it and look forward to returning soon! The Sparks Cottage was exactly as described! The rooms were clean and comfortable and the location was walkable to all the things we liked to do. The kitchen was well appointed and we had a great time cooking breakfast with food from Newport! I would definitely recommend for anyone! Loved our visit to Bend! The cottage was charming. We had wonderful hikes, rowing excursions and kayaking adventures in the near, (and somewhat near) vicinity. Loved the local brew houses, eclectic restaurants and charming breakfast spots in town. Wonderful place if you like a laid back atmosphere. Wonderful, quiet and conveniently located property, House has everything needed for a comfortable stay. Easy walk to downtown. 2 blocks from grocery store. Plenty of restaurants within a few blocks of rental. Well equipped kitchen and outdoor grill, make eating in a breeze. Staying here was perfect, its close to downtown and has some restaurants and coffee shops right around the corner. The house was adorable and extremely clean. Were very easy to reach out to and very helpful. We rented Sparks Cottage for overflow housing for a family reunion. It worked out perfectly! My out of sate family enjoyed the location and found the house to be comfortable and well appointed. We were experiencing 90+ temperatures during our time in Bend, but the cottage stayed cool and comfortable. We will definitely rent Sparks again in the future and will recommend it to others. This was a really cool, modern house in a great neighborhood! Only a short 10-minute walk (part of which is through the park) to get to restaurants, shops, farmers market, breweries, etc. Good space both in front and out back to hang out and relax. Wish we could have stayed longer both at the house and in Bend. Would definitely return! We came for a duathlon race and the cottage was very close to our race venue which was nice, but also biking distance to several brewerys and downtown. WE loved the cottage and it was very nicely redone. Beds were great! Great location in a quiet neighborhood. Walking distance to downtown, parks and good food. Sparks cottage was clean, cute and was perfect for our family of 5. The kids did not want to leave. . . and neither did I. Rebecca was great with communication and accommodated our last minute change to extend our stay. Looking forward to next time!